Posted February 11th, 2019 by Tim Anderson & filed under Uncategorized. It is typical to breathe a great sigh of relief once you file your taxes. But you haven’t yet been out of the trouble. However, the Internal Revenue Service (IRS) provides a computer screening process for each submitted return. And if your tax return makes mistakes, you have to pay the IRS a heavy price. For many small business owners, taxes are a challenge. What is deductible from taxation? What is the IRS going to make your audit? It is easy to make errors with your small business returns with so much going on in your world. Here are 3 silly mistakes we commit while filling our tax, as well as how to avoid them. First look, have you itemized your expenses? Jackie Perlman, a senior fiscal research analyst at H&R Block, said: “It’s an error that people make, particularly with good incomes. You only have to math and see whether your claims are larger than the standard deduction which depends on your filing status (single, married, head of household, etc.). “Many people are not itemized because they don’t own a home, however, there are other detailed deductions they can take advantage of.” Taking state revenue taxes, for example, from federal returns can be deducted. The deductions can also be made on local income taxes. 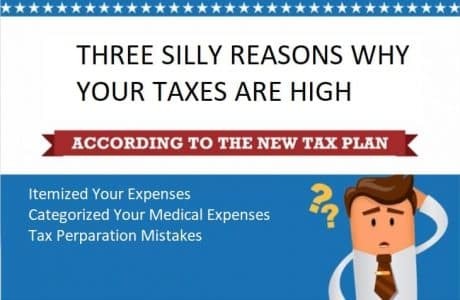 In addition, the amount can be enough to lower your taxable income versus the standard deduction if you had substantial medical costs or student loan interest. Students can reduce their taxable income by up to $ 4,000 through their tuition fee and their dues. How are you paying and categorizing her if your spouse works with you? You miss a serious medical expense allowance with a Medical Expense Reimbursement Plan (MERP). If you do not claim her as an employee. You can pay tax- free for the medical expenses that your staff does not cover, such as office co-pay, through a MERP. The absence of a spouse as a staff member may thwart its opportunity to establish a reimbursement plan for medical expenses and allow it to deduct medical expenses at the business level which are otherwise not deductible on account of the 10% Adjusted Gross Income limit. If your spouse is an employee in your company, you and your children can deduct tax under your qualified MERP both from your medical expenses and from your children. A mistake in typing numbers: Your tax preparer may accidentally put in the wrong income amount, itemizations, or exemptions. Misspelled words: Your tax preparer may also misspell your name, your spouse or your kids. Your address can be wrong. Simple mistakes such as these can cause your return to be attractive for IRS for an audit. A miscalculation in your income and deductions: Mathematical errors are some of the common errors on returns. When the numbers do not add up correctly, the IRS will take notice of it immediately. But we have not left you completely with your tax mistakes without giving you solutions. You can decide whether you want to reduce your taxes by the standard or by the itemized detection. The standard deduction reduces your revenue by a fixed amount. Instead, the list of eligible expenses includes detailed deductions. You can choose the one that most reduces your tax bill. If you are blind or 65 years of age, your standard deduction will increase. If you are a lone or head of the household or whether you are married or a qualified widow (er) it increases by $1,550 and by $1,250 respectively. Allows you a deduction, even if you do not have expenses eligible for a claim to itemize deductions. This means you do not have to detail deductions, for example, medical costs and charitable donations. Itemized deduction also reduces your taxable income. For example, If you come under the 15% tax brackets, each $1,000 in itemized deductions knocks $150 off of your tax bills. Your itemized deductions could, however, be lower than your standard deduction. If so, instead of claiming the standard deduction, you can still itemize deductions. Contact tax preparation firm immediately: You should immediately inform them of the errors found on your return. File to revise the return: If there is a mistake that caused you to overpay, you have three years to ask a refund of the overpaid taxes from the IRS. After three years, the IRS cannot do anything. File a legal action: If your CPA or tax prep firm is not cooperating with you to amend the errors, you can file a lawsuit for repayment. Although there are solutions but, you should be prepared to use these directions when you find mistakes on your own tax filing. You should ensure that the individual has these qualities before you allow anyone to file your taxes on your behalf. Every year there is over 60 percent of tax returns errors. You can file taxes without audit by finding out what common errors occur and what steps to prevent them. But except above all reasons, if you’re careless to obey tax laws or willfully pay no attention to the IRS regulations, the results can be serious. Errors lead to the result of fraud generally are referred to the Internal Revenue Service Criminal Investigation Division and can result in a penalty of 75 percent of the payment added to your return. “Frivolous” acts like tax protesters who intentionally file false amounts, may be charged a $5,000 penalty. Criminal penalties can also come in a line. For example, try to escape from taxation can bring a $250,000 fine and five years in jail.